This project is about programming in Java. The aim is to extend existing program (actor) running under Kepler workflow engine to be able to control visualizations with VisIt. 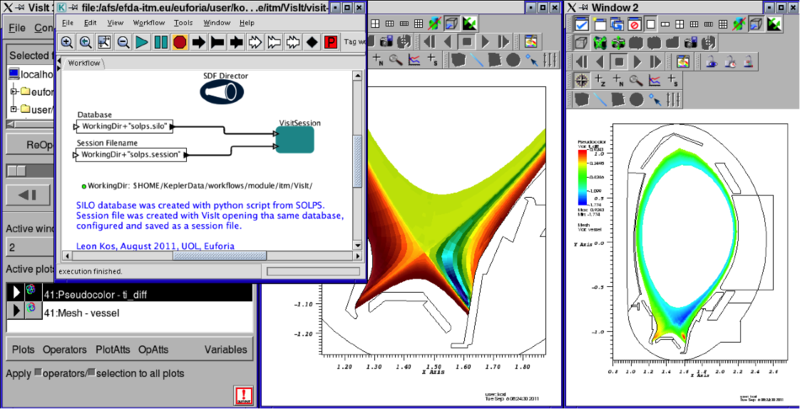 Kepler provides graphical user interface (GUI) for describing information flow between computing units called “actors”. An actor can be encapsulated code submitted to HPC/GRID or, in our case, VisIt visualization tool. VisIt provides a session configuration that can facilitate visualization with applied data operators, window positions, ranges, labelling, etc, to be stored/restored for reuse. Communication between Visit Kepler Actor (VKA) and VisIt is made with jVisIt library that VisIt provides when Java (Kepler native) language is required. Figure shows our “universal” VKA in a visualization-only workflow. Input database is a single (VisIt native) SILO file. VisIt use in workflow is therefore not bonded to specific type of input. Inter-process communication (RPC) between VKA and VisIt with its own GUI provides a possibility to user to further tailors visualization aspects and session configuration. Presently, VKA works, but several shortcomings were spotted within various workflows. Generalization VKA code for use under different cluster configurations. Adding Java GUI for session control and host submission. Target visualization here is not specifically prescribed and can be tailored to student specific aspects that suit their abilities and interests. If this interest will not be specific then mentor will provide interesting workflows for visualization from the field of Integrated Tokamak Modelling of fusion experiments. In any case student will work closely with mentor on coding, running workflows and visualizations. on top of the VisIt windows (GUI, divertor detail and vessel mesh) showing simulation results from fusion code SOLPS. Become familiar in modelling scientific workflows with Kepler within HPC environments. Gain experience with HPC, LSF job manager and various simulation software readily available on HPCFS and other clusters. Programmatically control VisIt with actor written in Java. Become familiar with programming inter-process communications.